The word contextuall strikes fear in the hearts of many architects, not because sensitivity to one’s surroundings is a bad thing, but because its definition has proved to be so elastic, and even political. At one end of the spectrum, there is Prince Charles and his advocacy for 19th-century buildings with 21st-century technology; others argue that scale, massing, and material should be the central concerns for architects working within a developed site. For an arts building for the Barnard College campus, New York’s Weiss/ Manfredi Architects is making a strong argument for the latter approach. When the Barnard Nexus is complete in 2009, it should show that sensibility can be more faithful to context than duplication: Instead of using the red brick that characterizes many of the college’s older buildings, the architects riff on brick’s color and material qualities. 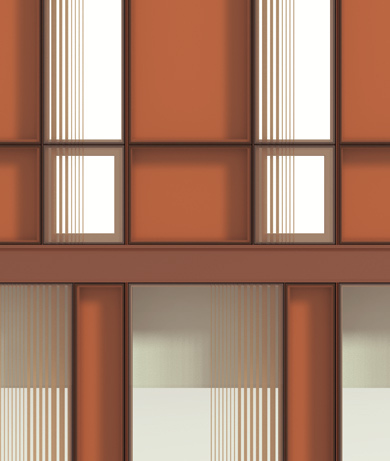 The steel-framed building will have a glass curtain wall whose surface suggests the spectrum of tone and texture inherent to brick. 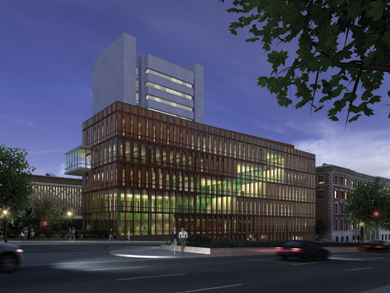 Weiss/Manfredi won an invited competition to design a new arts library at Barnard in 2004 based on a design that would rectify the longstanding problem of a dramatic grade change between Broadway and the edge of the campus at 119th Street that created an unfriendly wall along the street. Two ideas were central to their early schemes: The first was to draw the public green space up diagonally through the building, making it visible from outside; the second was to develop a curtain wall that was a mixture of terra cotta panels and glass. The terra cotta would be a gesture of solidarity towards Milbank Hall (1896) next door, while the transparency of the glass would let the building light up its corner of the green and encourage students to use it as a social space as well as an academic one. As the design process progressed, however, they began to consider different materials. Principal Marion Weiss described making a series of charcoal sketches of the facade and getting interested in the blurred quality it gave to the panels: When we were working with terra cotta and clear glass, it was either figure or ground,, she explained, but the charcoal suggested a less definite line. Sometimes the tools you use are suggestive, and it is important to be able to capture the quality of an accident.. The project team began to look at glass and different ways of using it. They developed a system whereby the colored glass panels would be backed by a shallow cavity closed off by sheetrock, which they began to refer to as a shadow box. This gap (which is still being determined, but could be anywhere from 3 to 5 inches) is clearly perceptible as sunlight passes through it; the vertical supports, which will be painted, read as somewhat darker, and give definition and depth to the cavity, Like luminous terra cotta,, as Weiss described it. They are still experimenting with the shade of the sheetrock back panel, and Weiss said that it may well change over the course of the building in order to give more texture to the faaade. Partner Michael Manfredi described bringing endless samples to the roof of the building and seeing how one piece of colored glass looked 3 inches away from the back panel versus 5, or with white sheetrock behind it versus colored. The deeper the shadow box,, Weiss said, the more expensive it is, but it is also a richer effect..
Weiss/Manfredi found a company that could acid-etch or bake color onto the number 1 [exterior] surface of a glass panel. Usually the frit is on the number 2 or 3 surface, so the exterior is still highly reflective,, explained Weiss. The acid-etched frit gives a softer matte texture to the glass surface. Another issue was color: It is often laminated between two sheets, but the problem is that you are paying for more glass, and because the panel is heavier, the curtain wall structure has to be stronger.. The pattern on the facade loosely follows Nexus’ more public spaces, which form a diagonal path through the building and terminate in a rooftop garden. To standardize construction, they developed a five-foot module, but have been able to give the faaade a finer overall grain by using more or less frit as needed. Mindful of the lessons of the charcoal sketch, the transitions from clear to opaque are rarely abrupt. 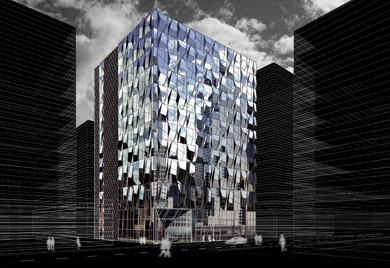 Glass is typically treated as a neutral skin, and architects want to dematerialize it and make it go away,, said Weiss. We got interested in its presence and potential for decorative richness.. Anne guiney is an editor at AN. 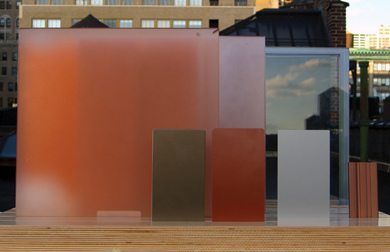 Below: Weiss / Manfredi photographed various glass samples on the roof of their office in order to better understand the way shadowboxes of different depths would affect color and opacity in sunlight. 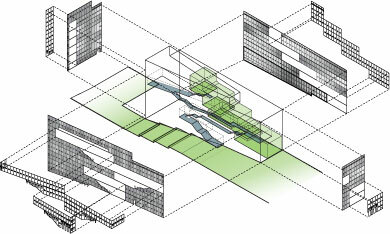 Below: Exploded axonometric showing the Nexus’ primary circulation route (blue), the open, public spaces which are an extension of the campus green outside (green), and the gradations of colored, fritted, and clear glass panels which clad the exterior (grayscale). Mullion/Metal Cladding: Custom color three coat fluoropolymer metallic finish. 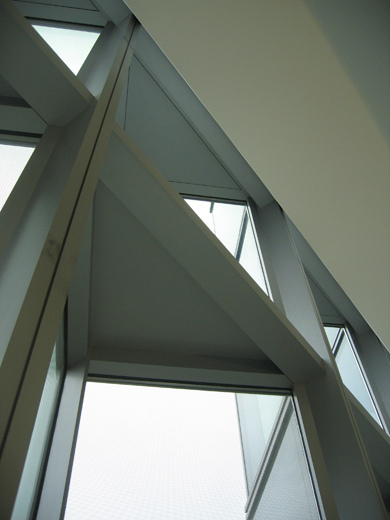 Exterior Glazing: Four-sided structurally glazed unitized aluminum system. Multiple combinations of clear low-e (low iron), etched glass, etched tinted glass, and color translucent ceramic frit. Built-up roofing: Hydrotech garden roof system consisting of lawn and low-maintenance sedum. Glass: Interior Glazing: Glazed system with custom graphic interlayer. Skylights: Custom translucent etched walkable surface set into pavement. Like its pristine Miesian predecessors, the Toledo Museum of Art’s new Glass Pavilion is seductively light and deceptively simple. It appears to be a straightforward glass box under a flat roof, but unlike the Barcelona Pavilion or the Farnsworth House, this building houses a series of discrete spaces that serve a wide range of programs including a caff, exhibition space for light-sensitive objects, and a workshop for glass artists. The Tokyo-based firm SANAA has used this programmatic diversity to push the possibilities of a glass pavilion in both scale and ambition. For the firm’s many admirers, the projecttSANAA’s first in North Americaais an amplification of the work they have become known for, like the Kanazawa Museum of Contemporary Art, which also uses curved glass and simple massing strategies. Within the pavilion’s all-glass rectangular box, 13 glass volumes float almost bubblelike in plan and act as various gallery, event, and exhibition spaces. The programmatic requirements for the space were the primary generator for SANAA’s emphasis on discrete volumes in the project, explained principal Ryue Nishizawa. Our design came from the museum itself: Different temperatures and humidities were needed for various rooms, including a hotshop that generates an enormous amount of heat. Also, it is a big place [76,000 square feet] and we needed to break up the space.. Between most volumes are interstitial spaces that act as insulating pockets, further regulating the interior conditions of the galleries. While minimalism is often thought of as stripping down and removing the inessential, it is just as much about hiding the unappealing but necessary. In this case, SANAA embedded most of the structural columns within the four rooms which are not glass encloseddthree are built with standard a wood frame and sheetrock, and the fourth is clad in rolled steel. Slender columns are scattered throughout the interstitial cavities, but sited to obstruct sightlines minimally. To avoid disrupting the irregularly spaced and sized rooms, the firm, with structural engineers Guy Nordensen & Associates, planned an intricate roofing system to accommodate mechanical systems and maximize structural capacity without requiring a regular column grid. They managed this by using differently sized beams that worked around the columns and HVAC systems, all of which were locked into perpendicular girders through flanges. Given that the roof is only 24 inches from top to bottom, it required coordination between the structural and mechanical drawings,, described SANAA project manager Toshihiro Oki. Also, they used -inch plate steel on the corners of the building to act as bracing for lateral loads. This allowed the columns to be smaller and support only vertical loads. The 13-foot-high glass panels which define most of the volumes had to be shipped from Austria to a plant in China and custom-formed through a slumpingg process, in which the glass is placed above a curved mold and then heated until it settles into place. The glass panels are flat, fully, or partially curved, and while many are different, the designers tried to standardize some of the curvatures in the building. Oki estimated that approximately 30 different molds had to be fabricated to create the panels. These panels are slotted into tracks on the floor and ceiling. 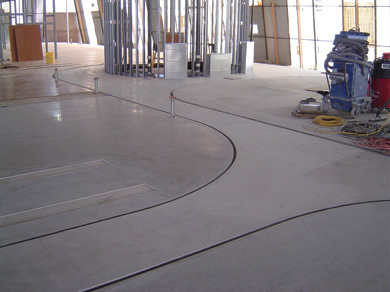 The lower tracks are embedded into the structural concrete floor with 3-inch slabs, and employ a U-track system with a rocker device at the bottom of each track to allow the glass panels some degree of movement. The rocking mechanism is stainless steel, and has a shallow parabolic shape. This keeps the glass level and vertical, and the flexibility minimizes the potential for breakage. The top track employs Teflon slip-plates to minimize friction and allow the glass to move slightly based on vertical loads. An L-shaped -inch steel plate is locked into place after the glass is installed to hold the panel in place. This support system is both stable and flexible, allowing the system to respond to external factors without discernible effect on the panels, which, with many measuring 8 by 13-feet, are quite large. The designers used low-iron, Pilkington Opti-white glass in order to minimize green tint and provide colorless transparency, and also to acknowledge their interest in manipulating that transparency: We realized that curved glass would transfer light differently, and also transparency would change in the building just through the layering of glass,, said principal Kazuyo Sejima. In the mock-up we built, even two layers created a certain level of opacity.. While the firm has worked with curving glass before, Toledo’s Glass Pavilion allowed a new kind of experimentation. We were able to work with much thinner glass in Ohio than in Japan,, noted Sejima. The result is both greater clarity and more precision with the forms. The building is a perfect vessel to showcase glass, itself a feat, but as Sejima commented, the material may be fragile, but working with it is really no big deal..
Jaffer Kolb is an assistant editor at AN. 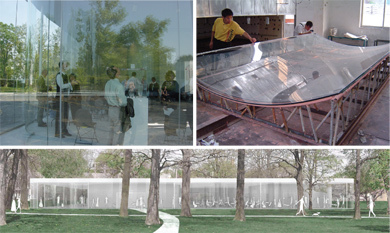 SANAA built a full-scale mockup (center) of the Toledo Museum of Art’s Glass Pavilion (bottom) to test the visual effect of layering the glass walls, which were slumpedd on frames (center right) in China and are held in place by track inset into the concrete floor (top right). According to Chris Cooper of Skidmore Owings & Merrill, creating an all-glass building in New York City is a lot harder than it seems, especially while trying to work within the financial constraints of a speculative office tower like 7 World Trade Center. In Europe, it is becoming more and more common to use a double skin. As we were thinking about how to brighten the exterior while still using standard construction techniques, we reached out to Jamie Carpenter of James Carpenter Design Associates (JCDA), and together we looked at ways to bring light into the spandrels.. The solution the two firms ultimately came up with is a system whereby the window glass hangs over the finished edge of the floor slab, which is clad in galvanized steel panels. 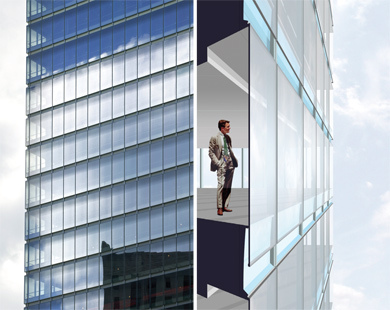 The resulting cavityywhich is open to the air, as each glass panel covers only 11 of the 33-foot slab depthhallows the glass to seemingly lighten the building’s facade between floors . Clear glass with space behind it is always brighter,, said Cooper. To subtly increase that effect, they added a strip of blue stainless steel to the base of the sill. You can’t see it, but the blue steel tempers the quality of the light as it reflects it,, explained Cooper. When architects Frank Barkow and Regine Leibinger were asked to design a spec office building in an area of Seoul that hadn’t even been developed yet, they realized they wouldn’t be able to turn to the usual sourcessthe needs of clients, the feel of the neighborhooddto begin the design process. The site is a part of Digital Media City, a government-initiated project that will ultimately be a 2.5-square-mile business center between the airport and downtown Seoul. Since the only truly known quantity they had at the outset of the process was the budget, Barkow Leibinger decided to plan for the worst: The architects developed a highly reflective glazed primary faaade that would, in Barkow’s words, take the neighborssno matter how terrible they might beeand pixilate them into coolness.. A mockup they built and put in the courtyard of their Berlin office showed endless fragmented images of the brick building, small triangles of blue sky, and cubist versions of anybody who happened to walk by. The polygonal geometry of the faaade grew in part from conversations with the artist Olafur Eliasson, who was also working on a piece called the Quasi-Brick Wall that explored likeminded ideas. Eliasson served as an in-house critic for Barkow Leibinger while the Berlin office of Arup helped them turn the idea into a working curtain wall. 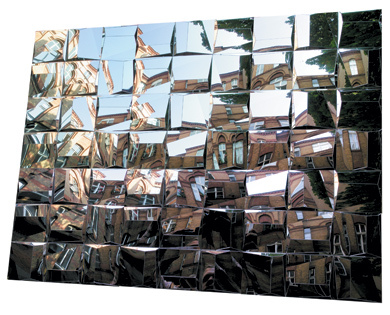 Below: A scale mockup of the faceted curtain wall gave a kaleidoscopic reflection of its surroundings, in this case, Barkow Leibinger’s Berlin office. Below: Barkow Leibinger designed an office building (below) for a site in Seoul’s new Digital Media City, which is a massive government-initiated development on the outskirts of the city. As one of the earlier projects to go into construction, the only real constraints on the architects were zoning restrictions and budget. After the United States Embassies in Kenya and Tanzania were bombed on August 7, 1998, leaving 224 dead and 5,000 injured, the Government Services Administration (GSA) beefed up its blastproofing standards for new construction. Rafael Viioly Architects had already begun design work on the Bronx Criminal Court Complex in New York, and while blast resistance was included in the program, the architects decided to team up with curtain wall fabricator Enclos Corporation to incorporate the GSA’s new standards into the all-glass design. The court complex was already under construction when September 11 prompted safety requirements to be raised yet again, but Viioly’s building already met most of the new standards, so the architects didn’t have to put construction on hold. 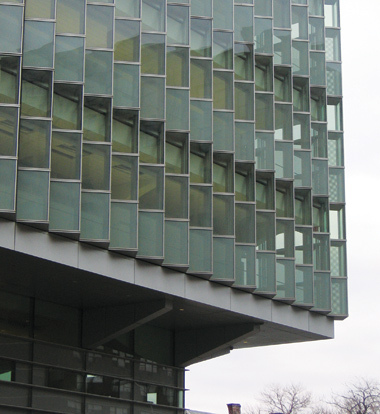 The building’s primary street-facing curtain wall is a series of triangular protrusions that form a sawtooth shape in plan; structural silicone holds Viracon low-E insulated glass panels in aluminum mullions. We were working with the physics of blasts,, said Fred Wilmers, project architect at Rafael Viioly Architects. They are impulse forces that last a matter of seconds, so a flexible surface that gives with the blast but remains intact, is actually more efficient than a rigid surface.. For example, a 1,000-pounds-per-square-foot blast applied to a rigid surface would produce a much higher-static pressure than the same blast load applied to a flexible surface, like a curtain wall system. Due to security concerns, Wilmers was unable to speak specifically about the level of blast the court is built to withstand. He did say that the criterion for passing blast force is that glass doesn’t fly into the building more than a certain distance. This means that not only does the glass have to stand up to a blast (a PVB interlayer on the interior pane prevents it from shattering), but so does the aluminum and silicone. The sawtooth shape that is so central to the building’s aesthetic is also an important component of the curtain wall’s blast resistance: Because the blast force would presumably meet the glass at an angle, its impact would be more diffused than on a flat surface. The designers also worked with the assumption that blasts would come from street level, so the wall was designed with a vertical gradient of blast resistance. On lower floors, mullions are reinforced with steel. Blast resistance is about protecting the people inside the building,, noted Wilmers, not the building itself. After a blast, the outer panes of the glass would be shattered and the aluminum would be distorted, but the people inside wouldn’t be hit with shredded aluminum and glass shards. It is for a one-time use, howeverrit couldn’t resist a second blast.. The fact that a glass curtain wall is capable of meeting current security requirements is the key lesson of this building. It offers hope that in this age of terrorism, civic structures don’t need to be concrete bunkers.